Summary: The film looks lovely, with beautiful shots of Kent and Sussex coast, and is a handsome heritage piece, a worthy addition to the Holmes legendarium. Mr Holmes takes as its conceit the idea that Sherlock Holmes (McKellan) is a real person, not a fictional character invented by Conan Doyle. His cases were fictionalized by his friend Dr Watson; Holmes himself has retired to the Sussex countryside where he tends his beehives and lives a hermit-like existence, with long-suffering housekeeper, the widowed Mrs Munro (Linney) and her son Roger (Parker) his only company. Holmes’ prodigious powers are failing him, but he knows that he has unfinished business – there is some mystery about his final case. The version that Watson wrote – presenting Holmes as the unerring hero who solves the puzzle – does not ring true. Roger, who barely remembers his father, is fascinated by the great detective, and the two develop a touching relationship. The boy looks up to him as a father figure, curmudgeonly though he might be; Roger is a bright boy, destined for grammar school in Labour’s post-war world. His mother has more limited ambitions; service is all she has known. She is terrified of losing her son, that as he becomes more educated, Roger will learn to despise her. 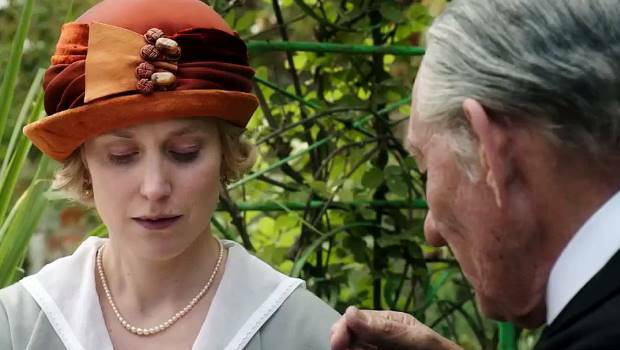 Ian McKellen as Sherlock Holmes and Laura Linney as Mrs Munro. 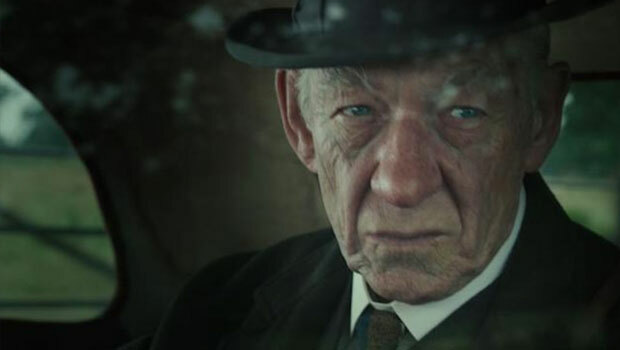 Mr Holmes reunites McKellan with his Gods And Monsters director Bill Condon and, as in that film, follows the biopic convention, this time for a fictional character. Indeed it delights in playing with the genre; we see Holmes (a fictional character, presented as real) watching ‘himself’ (played by Nicholas Rowe, who was Young Sherlock Holmes in the Speilberg film) in the cinema, reading about ‘himself’ in books. Holmes also writes his own version of his last case. This layering of fictionality explores the idea of identity, particularly interesting in these days of social media. It also looks at aging, particularly cruel to a man of Holmes’ brilliance. He is well aware that he was extraordinary, a genius but now both mind and body are failing him – he desperately wants to remember, and tries everything to restore his powers including royal jelly and Japanese wood ash – and everyone who knew him, his peers, are dead. His loneliness is palpable; Mrs Munro mirrors it. In solving the mystery of his last case Holmes comes to a new recognition of what it means to be a human being, with connections to the world; in his twilight years, no longer puffed up with a sense of superiority, he becomes a much nicer person. The film looks lovely, with beautiful shots of Kent and Sussex coast, and is a handsome heritage piece, a worthy addition to the Holmes legendarium.